In recognition of the hard work and dedication of nurses throughout Canada, Unifor celebrates and salutes all nurses on National Nursing Week, held on May 7 to 13 this year. There are an estimated 415,000 nurses across Canada. The profession has grown by 18 per cent over the past 10 years, including both Registered Practical Nurses (RPNs) or Licensed Practical Nurses (LPNs) and Registered Nurses (RNs). In many provinces, RPNs/LPNs represent more than a quarter of all regulated nurses working in Canada. Any health service organization that wants to provide quality sustainable nursing care undeniably needs practical nurses! Nurses play a vital role in delivering quality care, along with a team of skilled allied health care professions including personal support workers, continuing care attendants and others who provide direct and indirect care that is critical to the well-being of their patients. Nurses understand that they function within an entire team of workers who are competent and efficient in often difficult situations. Practical nurses know mutual respect and teamwork are critical for upholding the highest standards of access and quality health care. 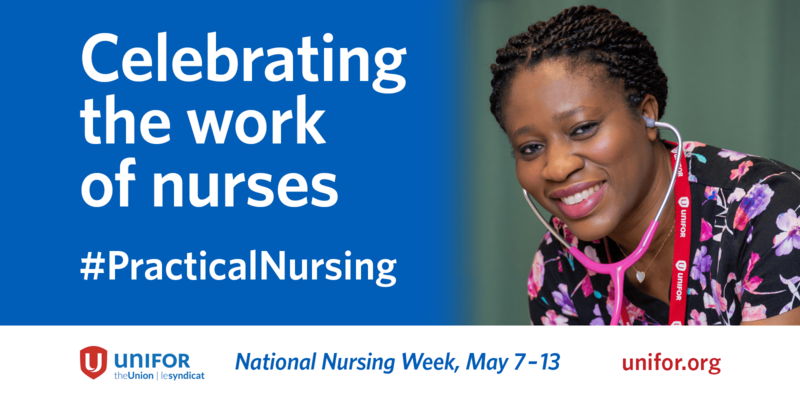 The dedication, compassion and resilience of practical nurses from coast to coast to coast and all their vital contributions to offer excellence in patient care is at the back bone of the health care sector. As we show our collective appreciation for nurses this week, it is also a reminder that much more must be done to ensure that all health care workers are able to provide care in workplaces that are safe, healthy and conducive to the well-being of patients and care providers. Statistics show that health and social services is one of the most dangerous industries in Canada, based on injuries that lead to loss of work time, and incidents of violence that are rising as the health care system is stressed to its limits. Unifor calls for a renewed commitment by governments and employers to commit to violence free workplaces, enforce preventative measures and provide comprehensive training and resources. Nurses and their colleagues in health care are increasingly over-burdened in the face of hospital overcrowding, chronic short-staffing and budget cuts. With an aging population that requires complex care, they still manage to meet patients’ needs competently. And even with all these workplace challenges the nurses continue to provide dedicated quality care. Join us in saluting nurses in your community. Get timely updates from Local 1996-O in your inbox. Sign up for the latest from Local 1996-O in your inbox! © 2019 Unifor 1996-O. All rights reserved.